The annual 2018 Flying Star is derived from San Yuan Xuan Kong Flying Star system. The chart provides valuable information of the energy governs by each direction. 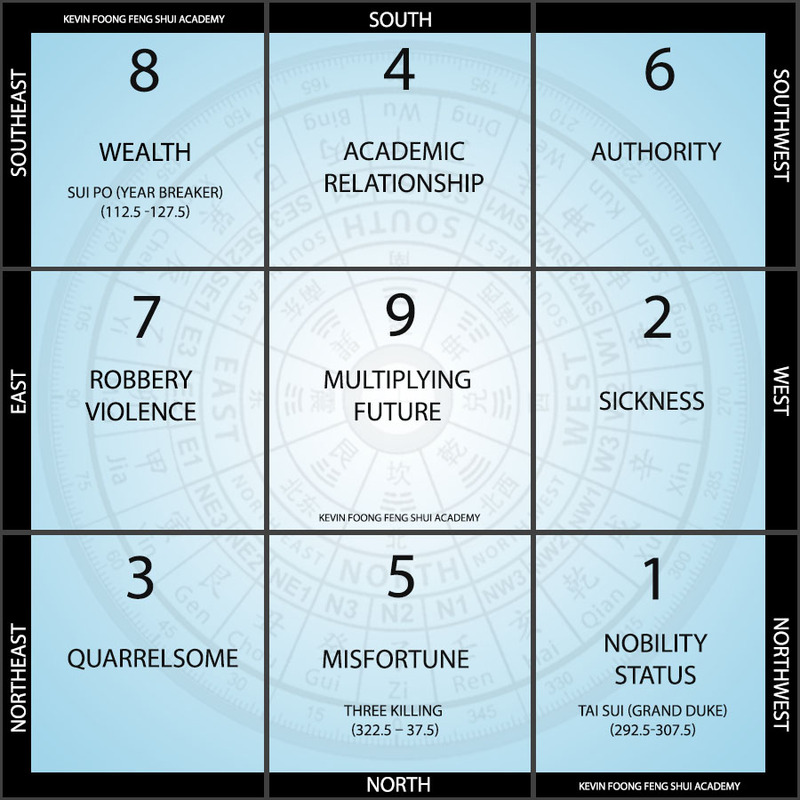 In using the flying star feng shui, it can be used both as a divination method to worldwide events as well as mapping the internal energy of your house structure. Xuan Kong Flying Star is based on timely and untimely energy activation. It doesn't always meant the 5 Yellow Star is a disaster star. When used in the right period and timeline, the 5 yellow star can bring tremendous wealth. We should utilise the good energy star and avoid the negative energy star by studying the direction each star governs in 2018. Utilise doesn't requires you to buy any feng shui item such as dragon of Pi Xiu to activate it. Understand that feng shui talks about the environment our body resides in. Just by studying or doing your work in the right sector of the energy, one can manifest the great result the star energy bring in 2018. The flying star system is focus on each period of 20 years (later heaven) and period 8 is between 2004-2024. For early heaven energy activation, we are currently already transiting to Period 9, although later heaven energy will officially kick in after 2024. Important note: The advice below is for anyone who does not have proper classical feng shui audit of your house. For those that have completed a professional feng shui audit done by Master Kevin Foong, only refer to the inauspicious direction that you should not activate the energy. When does the 2018 flying star energy begin? The flying star energy follows the 24 Solar Terms activation which happen to be right after 4 February 2018 0528 hour. Star 1 Nobility (NorthWest) - The Star 1 which governs nobility, status and reputation resides in NorthWest. This is also considered the future governing star which is still a prosperous state. Considered using this sector for your work desk table, making sales phone call and drafting business development plan. It can be the Northwest of your living room or the Northwest sector of your bedroom. Having your house main door in this location represent great opportunities in 2018, you will have to grab hold of it fast. Never mind that it may not look lucrative as this star talks about future opportunity and expansion even when started small. Star 2 Sickness (West) - The Star 2 governs sickness and illness. It is best to avoid this sector if you can. Cooking in this sector can trigger the sickness star. Of course if your house have completed a proper feng shui audit with the right stove location, it is safe to ignore this. You may not want to get too cropped up in the West sector of your study room, as you may find stress will build up quickly and it is hard to gain progress. If your house main door happen to be in the West sector, pay close attention to your health and do not take things lightly when you are sick and go for your regular health check up. Star 3 Quarrelsome (NorthEast) - The Star 3 represent quarrelsome energy. If your sleeping bed is located in this sector of your bed room, you can find 2018 is going to be a very quarrelsome year between you and your partner. Consider shifting your bed to a better location. If your main door happens to be in this sector, you will have to learn to be more patient and do not let your temper get the better of you. Remember not to make any major decision when you are angry. Simply walk away from such situation, cool down and think through your decision. Star 4 Academic and Relationship (South) - The Star 4 is especially great for using it to pursue good academic result. Having your child PSLE or O'level this year? Try to locate their study desk to the South of the room, this will allow them to focus better and memories well. This sector also governs the peach blossom star which is great for anyone who is keen to pursue a serious relationship. Consider having a water feature in this area to activate the energy. Remember this only open up an opportunity, you must still go out and socialise if you are serious in not staying single. Star 5 Disaster and Misfortune (North) - The Star 5 is the infamous 5 Yellow star which governs disaster and misfortune as it is an untimely star in period 8. Activating this sector is a huge No-No and should be avoided totally. Activation meant drilling activities, knocking with hammer, ground digging or even very loud noise (energy wave). You should keep this sector silent and do not disturb it at all cost. If you really have to install that new clock and it requires drilling, you need to select an auspicious date and time to do the installation. I usually use Qi Men Dun Jia Date Selection to activate such activities as it governs current time space energy. 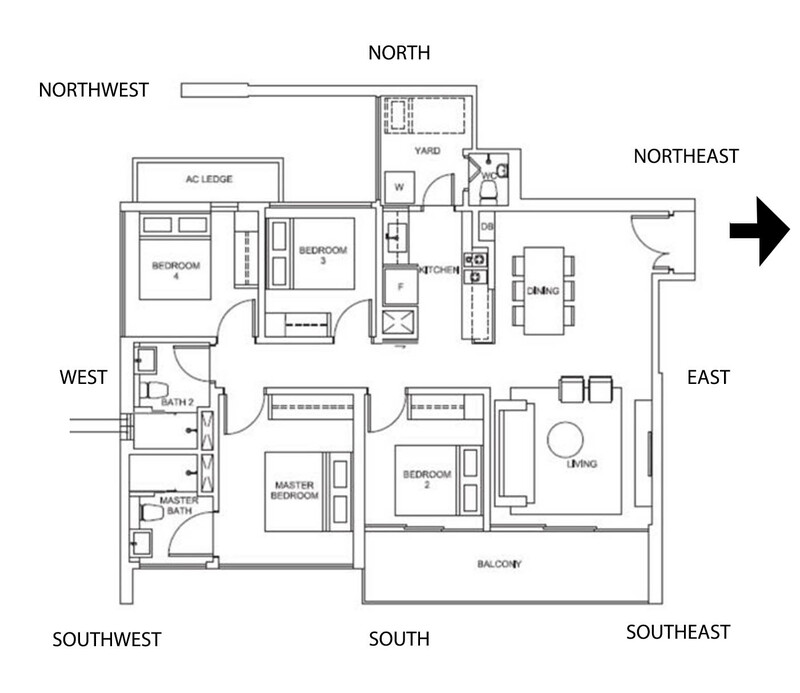 If your main door is residing in this area, and you should not renovate your house this year. When given no choice but to proceed, then one should use professional date selection to begin the ground digging process. Star 6 Authority and Reputation (SouthWest) - The Star 6 brought with it fame, status and reputation. If you are seeking that promotional chance of your, you should position your working desk in this sector to tap onto this energy. When your main door is located in this sector, there's a very good chance you will be given strong chance of taking up a higher responsibility in 2018. The business people can tap onto this sector for brand building, expansion and partner collaboration. Star 7 Robbery and Violence (East) - The Star 7 governs robbery and violence and is residing in the East in 2018. You should avoid activating this sector and if your working area fall within this area, remember to guard your valuables and avoid heated exchange with your colleagues. For those that have their main door residing in the East, it would be wise to install security system for your house to guard against robbery. You should be extremely cautious when returning home late at night. Star 8 Prosperous Wealth (SouthEast) - The most prosperous star 8 that governs wealth resides in Southeast in 2018. To pursue greater income source, investment, and business luck, consider having your working desk in this sector. For businesses that have the cash register at their retail outlet, considered relocating your cashier to this sector to increase more cash collection and business. If your house or office main door is located here, you should see more wealth accumulating in 2018. You should not waste this opportunity. Star 9 Multiplying Star (Centre) - The Star 9 is considered the next Period star and is an auspicious star. It has the capability of multiplying both good or bad star combo. Consider using the centre space to tap onto new opportunity or career option. Tai Sui Grand Duke NorthWest (292.5-307.5) - The Tai Sui otherwise known as the Grand Duke energy resides in the NorthWest between 292.5 degree - 307.5 degree. One should not disturb the sector of the Tai Sui by doing renovation, drilling or ground digging in this degree sector. San Sha Three Killing North (322.5 -37.5) - The San Sha Three Killing also resides in the same direction as the 5 Yellow Star in the North. You should not activate the energy in this sector through renovation, drilling or ground digging. If you can, completely shift your working desk or bed out of the North sector as it governs both 5 Yellow and Three Killing. For property or offices having their main door in the North, you should adhere strictly not to activate the energy unnecessarily if you do not want to handle more challenges and obstacles. Sui Po Year Breaker SouthEast (112.5 - 127.5) - The Sui Po or Year Breaker energy is the complete opposite of the Tai Sui direction. One should not activate this sector unnecessarily through renovation, loud noise, drilling or ground digging. Both Tai Sui and Sui Po governs a smaller degree compared to Three Killing which governs 3 mountain of 45 degrees. In this example, the main door is located in the NORTHEAST sector but facing East. You would need to read what does NORTHEAST energy covers in 2018. In the concept of using Xuan Kong Flying Star Feng Shui, there are big Taiji and small Taiji. 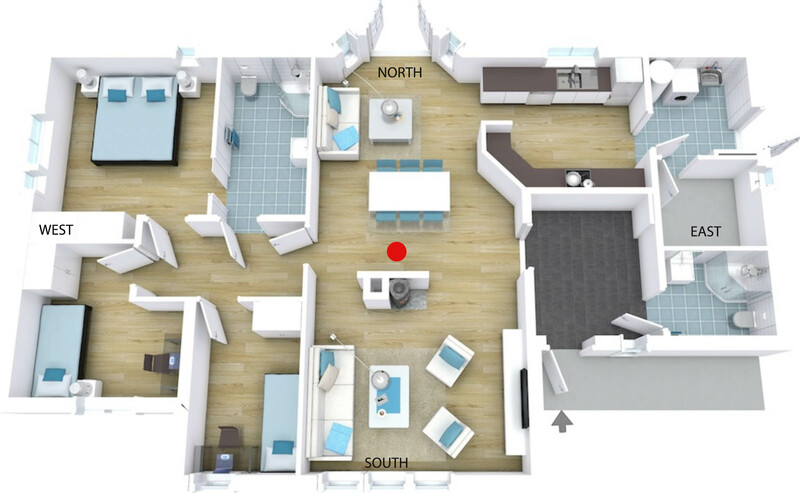 This means you can also divide your study room, bed room into 9 equal grid and use the best direction each sector governs to get what you want. Always remember the first rule is to avoid activating the negative energy through drilling, knocking, loud and noises. To continue learning more on Feng Shui and Chinese Astrology, click here to join our private Facebook Group. Master Kevin Foong is one of the most sought-after professional Feng Shui & Bazi consultant in the world. Featured by The Straits Times, Business Times, Channel News Asia, South China Morning Post. Can You Renovate Your House Based on Feng Shui in 2016 and 2017?